Music is central to the worship life of First Presbyterian Church. Music is chosen to support and reflect the sermon theme and texts of the Sunday morning services. First Presbyterian Church offers many opportunities for members and friends to become involved in music ministry. The Chancel Choir is the service choir for the 11:15 traditional worship service and special services, September through May. Rehearsals are on Thursdays from 6:30 - 8:30 pm and Sunday mornings at 10:30 am. Childcare is available during rehearsals. Contact Derrick Parker for more information. This team leads worship during the 8:45 am contemporary service and special services throughout the year. Rehearsals are on Tuesdays from 6:45-9 pm and Sunday mornings at 7:30 am. Childcare is available during rehearsals. Contact Derrick Parker to set up an audition. 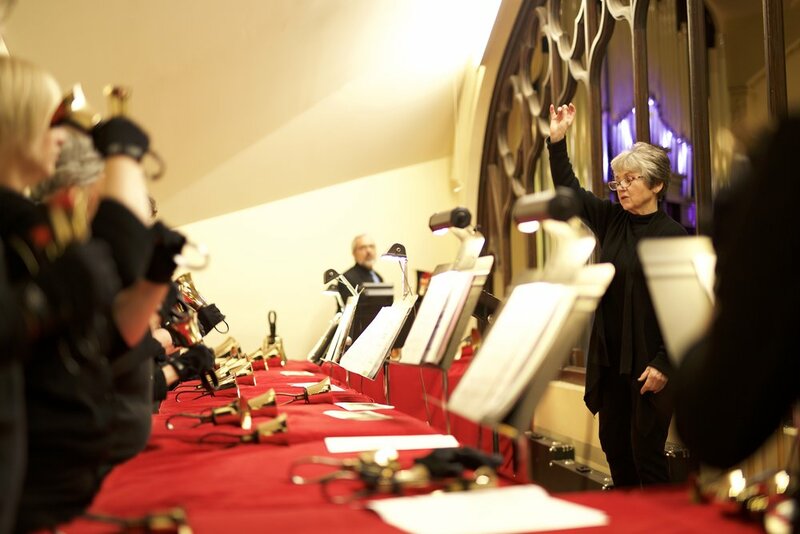 An intermediate handbell choir. This group rings once a month and special services, September through May. Rehearsals are on Wednesdays from 7-8:30 pm. Contact Diane Doughty for more information. This choir is comprised of children from grades1-6. They sing periodically at Sunday worship services and special services, November through April. Rehearsals are on Thursdays from 6:30-7:30 pm. Fall choir/drama rehearsals begin in September as they prepare for the Children’s 4 pm Christmas Eve Musical . Contact Catherine Hessler for more information. 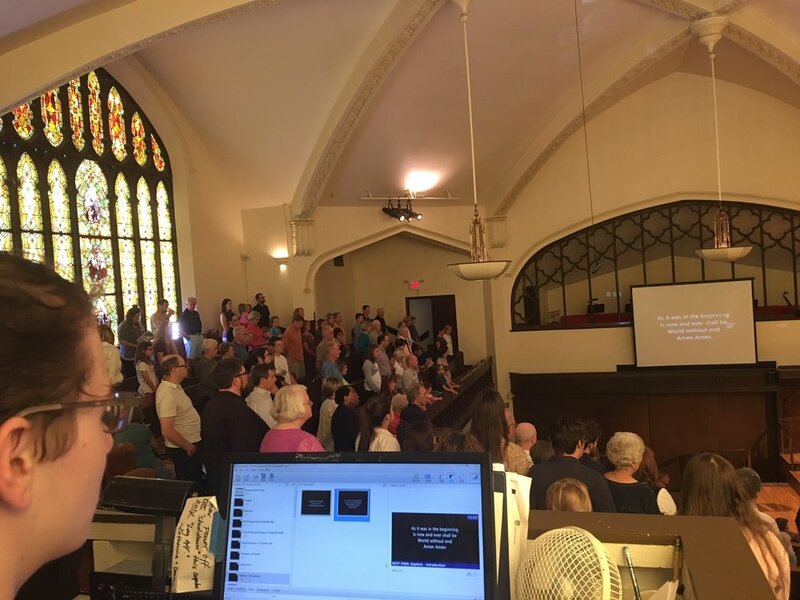 This volunteer ministry supports the worship services by running a computer program which shows the lyrics, scripture and other slides. If you have computer knowledge and are detailed oriented, contact Catherine Hessler. In 1992, it was decided that the 80 plus year old ESTEY organ had reached the end of its service to the church. It would cost too much to rebuild it and bring it up to modern Tonal specifications. Under the guidance of Dr. John Ellis and Dr. Lee Garrett, Schantz Organ Company was selected as the builder for this 4 manual and 64 rank organ. The facade and case designed by Schantz architect Eric Gastier, contain pipes of polished Tin and Zinc. The main manual chests are sliders with electric "pull-downs". The instrument is multiplexed, has 99 levels of combination memory and full MIDI capabilities. Tonal finishing was under the direction of Burton Tidwell, Tonal Director and R. L. Husley, tonal associate.